Overlooking Dubai Marina, Dubai Marina Mall is one of the city’s smaller and more understated shopping and entertainment destinations. Opened in 2008 with a central domed atrium and around 140 outlets spread across four levels, the mall exudes a calm and unhurried atmosphere in keeping with its waterside location. Opening onto Dubai Marina’s waterfront, the Dubai Marina Mall is ideally located for relaxed shopping and dining. Visitors can enjoy a wide spectrum of retail outlets, from couture houses and high-street brands such as Nike and H&M to cosmetics, gift shops, and a supermarket. Restaurants serve everything from gourmet burgers to Italian cuisine, and attractions include a Reel cinema and kids’ amusement center. Travelers can experience the Dubai Marina Mall in various ways. Most Dubai tours stop at the marina to spotlight its skyscrapers and yachts, while some allow time for strolling and shopping. The mall is also on the sight list on Arabian dhow, yacht, and speedboat cruises that depart from the marina. Most evening Dubai tours visit the mall for photo ops of the city’s glittering skyline, including the beautifully floodlit mall. 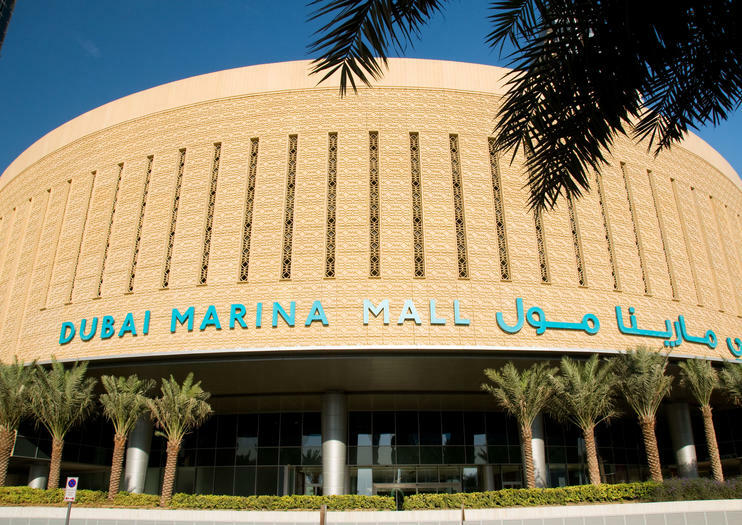 Dubai Marina Mall will appeal to shopaholics, families, and sightseers. Free parking and complimentary Wi-Fi are provided on-site. ATMs, stroller rental, and a wheelchair service are available. Attractions include a kids’ minitrain on the ground floor. Located between Sheikh Zayed Road and the Dubai Marina, the Dubai Marina Mall is easily accessible. The quickest options are to take a tram to the Dubai Marina tram station or the metro to the DMCC stop and walk across the overpass to the mall from there. Buses also run to the Marina Promenade stop, about a 10-minute stroll from the mall. By car from downtown Dubai, follow Sheikh Zayed Road and take the tunnel after exit 32. The Dubai Marina Mall is open 10am–11pm Saturday to Wednesday and 10am–12am Thursday and Friday. As it has fewer big-ticket leisure attractions than some Dubai malls, it never gets overcrowded—although it’s generally busier on Thursdays and Fridays. If you’re visiting the Dubai Marina Mall, factor in time for a stroll along Dubai Marina’s waterfront. Leave the center on the marina side and amble along The Walk—a 4-mile (7-kilometer) palm-dotted esplanade. You’ll be treated to fabulous views over the city’s high-rises, including the twisting Cayan Tower, and the marina’s gleaming luxury yachts. Are you interested in a Zipline adventure but not necessary chasing the highest altitudes or fastest speeds? The new Xline is the world's longest urban zipline, set in Dubai Marina and measuring 1 KM in length. It is also one of the steepest and fastest with an incline of 16 degrees and travelling at an average of 80 KM per hour.XLine Dubai Marina is a double line experience, which means 2 people can ride next to each other at the same time. 1 adult per line. The take-off platform is located at top of one of the Amwaj Towers and is 170m above ground level..
Soak up the magic of Dubai after dark on this 4-hour panoramic evening tour. As dusk falls, admire the city’s famous sights bathed in floodlights as your guide shares facts about Dubai’s history and culture. See the Burj Al Arab, Palm Jumeirah, Dubai Marina and other landmarks; admire the beautifully lit waterways of Little Venice, known as the Madinat Jumeirah; and experience the lights, music and dancing cascades of a Dubai Fountain Show. Upgrade to visit the Burj Khalifa observation deck to witness the views down over the sparkling city. Cruise along the Dubai Marina, under the illuminated skyline of the city on this dinner cruise. Enjoy the views and sights of popular Dubai landmarks like the Cayan Tower, Marina Mall, and a man-made island as you dine on a buffet dinner with background music playing. Round trip transportation from your accommodation is included. A memorable luxury Marina dinner experience in a modern boat with convenient roundtrip transfers from your hotel in Dubai. Receive red carpet welcome treatment and get on board with a drink to the minute you disembark and canapés as you admire the floodlit landmarks from the glass-enclosed or outdoor decks.Sail through the Marina mall, Jumeirah Beach residence under the illuminated skyline of Dubai Marina Palm Jumeirah upto the Atlantis the Palm where you can get some perfect photos as well. Dine from a delicious 5 star buffet contains continental and oriental dishes with unlimited soft drinks and beverages and enjoy live entertainment e.g Traditional Arabic Tanoora show on board. Zip around the Palm Jumeirah and The World archipelagos by speedboat on a thrilling 2-hour cruise from Dubai. Board your sleek vessel and jet around the Palm, the palm-tree-shaped archipelago off Jumeirah. Gaze at the colossal Atlantis The Palm hotel and speed further out to sea to The World, with its artificial islets designed to resemble different countries. Lastly, cruise around the stunning, sail-shaped Burj Al-Arab. Choose from three departure times, and enjoy complimentary sodas and water, and a personalized atmosphere on this small-group experience, limited to just six people. Seeing Dubai’s modern sights independently will probably involve metro trains, buses, or cabs, or walking in the hot sun. This tour lets you give the heat and hassles a miss with a guided bus tour and boat trip. View the Burj Al Arab and more by air-conditioned bus; shop and have lunch (own expense) at Dubai Mall; and cruise by the towers of Dubai Marina. Convenient hotel pickup is included. Explore the thriving metropolis of Dubai on this guided, full-day, small-group sightseeing tour. Step into Dubai’s past at Bastakyia, its most engaging neighborhood. Cross the Dubai Creek to take in the breathtaking view of the city. Visit Dubai Gold Souk, a market located in the heart of the commercial business district. See the Jumeirah Mosque, the most photographed mosque in all of Dubai and much more. Midday, enjoy a buffet lunch by the Dubai Fountain, the world's largest, choreographed fountain system. Admission ticket for the Dubai Museum plus a hotel pickup/drop-off included. Check out the contrasts and charms of Dubai on this private 6-hour tour. Alongside your own private guide, gain insight into the city’s heritage and discover must-sees such as Dubai Marina, Palm Jumeirah and the Burj Al Arab. Stroll the history-steeped lanes of Al Bastakiya, where pearl traders settled in the 19th century; cross Dubai Creek on an ‘abra’ boat; and dive into the vibrant Spice and Gold Souks. Finally, view the stupendous Burj Khalifa, the world’s highest building; and experience Dubai Mall, one of the planet’s biggest shopping complexes. The glittering skyscrapers, shopping malls, and manmade islands of Dubai Marina add up to make it one of the world’s most impressive waterfront complexes, and the best views are from the water. Hop aboard a traditional Arabian Dhow for a scenic cruise around the marina, passing the Palm Jumeirah islands, Jumeirah beach and the futuristic Burj Al Arab hotel. Experience three sides of Dubai — the older and new city, and the desert — on this full-day experience. First, check out top Dubai attractions including skyscraper-ringed Dubai Marina, Dubai Mall and Dubai Aquarium on a city tour. Admire the Burj Khalifa, the world’s tallest building, and then head into the beautiful desert. Traveling by all-terrain vehicle, cross the dunes, watch a sunset, and visit a desert camp to enjoy a camel ride and more. Cap your day with a buffet and barbecue dinner, and live belly dancing entertainment under the stars. Dive into the highlights of Dubai on a 4-hour private tour from Dubai, Abu Dhabi, Ras al-Khaimah or Fujairah. As you travel between the sights, hear entertaining facts about the city and its architecture, and enjoy photo stops at icons such as the Burj Al Arab, Dubai Marina and Atlantis resort on Palm Jumeirah. Learn about the city’s past at Dubai Museum, and discover timeless souks, Dubai Creek and Dubai Aquarium. Wrap up your explorations at the Burj Khalifa’s 124th-floor observation deck, surrounded by the 360-degree, bird’s eye views. Enjoy a romantic dinner cruise aboard a traditional-style 'dhow' (wooden Arabian boat) on this Dubai Marina experience. Cruise along Dubai Marina, passing mega-tall skyscrapers and apartment towers, and admiring landmarks such as Dubai Marina Mall and the Palm Jumeirah all bathed in evening lights. As you sightsee, enjoy a buffet dinner with sodas, water, tea, coffee, and live entertainment included. Your package also includes central Dubai hotel pickup and drop-off. Getting to know the Dubai Marina and the Palm Jumeirah by walking, soaking up the atmosphere of a very unique place in Dubai and in the entire world. Luxury yacht boat is the most common tour for tourists in marina side, this kind of boat used for sightseeing, the tourists can see the sightseeing of Marina, JBR, Lagoon, skydive, sheikh palace, the palm and Atlantis. ◉ Luxury Yacht 11 People Capacity◉ 42ft Luxury Yacht Sea Ray◉ 90 minutes Sightseeing of Dubai Marina, Jumairah Beach Residency, Sky dive, Dubai Eye, and Atlantis the Palm.◉ Available daily 24/7◉ Complementary Ice & Water◉ Located in Dubai Marina ◉ We are not provide foods or drinks but you can bringPackage is not applicable on new year eve. A journey through modern Dubai, the cruise takes guests through the area surrounding the Marina, known as Canal City. This exciting development area is an awe-inspiring insight into the contemporary architectural marvel that is modern Dubai.Gaze in awe at the skyscrapers lining path of the cruise, and see buildings such as the Dubai Marina Yacht Club, the Dubai Mall, and other features of the famous skyline.Ca see some of the most iconic parts of Dubai, learn all kinds of fascinating information about the city, and have endless amazing photo opportunities.A commentary is available in English throughout the cruise, and you can enjoy a relaxing selection of Western and Arabic music to set the scene. Tours last approximately one hour, making them the ideal choice for travelers who are short on time but still want to enjoy sightseeing Dubai Marina.